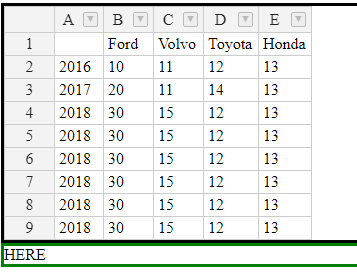 I have two sibling divs, one div for the table and a second div that I click on to add new rows. When I click on the second div a new row is added to the table - as the table grows the lower div is pushed down. 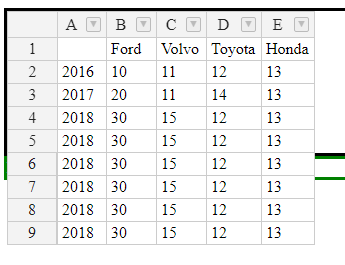 However, if I click on a cell, and then click on the second div, then the table starts to flow over the second div. I have to say that it looks very mysterious and if fact it might me a Handsontable bug. I knew that it may have something to do with overflow and found settings that fixed the issue for Chrome (using -overflow: -webkit-paged-x;). I couldn't find any solution of Firefox.